Updating of existing skills is an essential requirement in today’s fast changing world. 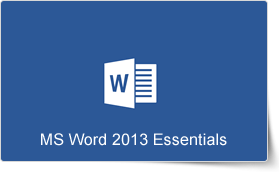 Users of Word may quickly learn essential skills in using Word 2013 with this dynamic course. This training course in Word 2013 Essentials includes training in inserting art and objects to a document, customizing a document, formatting, customizing the interface, and printing and sharing a document.